One of the most important things you can do to your content is to make sure it is as accessible as possible. What I mean by that is when users land on one of your blog posts, they are all going to be in different situations, some might be commuting, some walking, some at work, designing, etc. 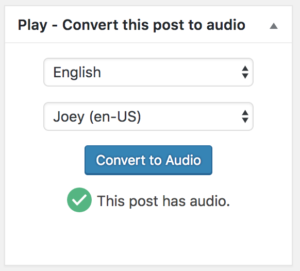 This guide will show you how to convert your blog posts to audio using the Play.ht plugin and make them available to users as podcasts. 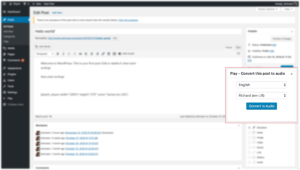 The first thing you need to do is download and activate the Play.ht plugin for WordPress. You can either search for Play.ht on the plugin store or download a zip file from here. 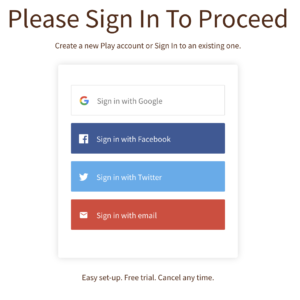 If you are new to downloading WordPress plugins, checkout out this article on how to download and activate the Play.ht plugin. 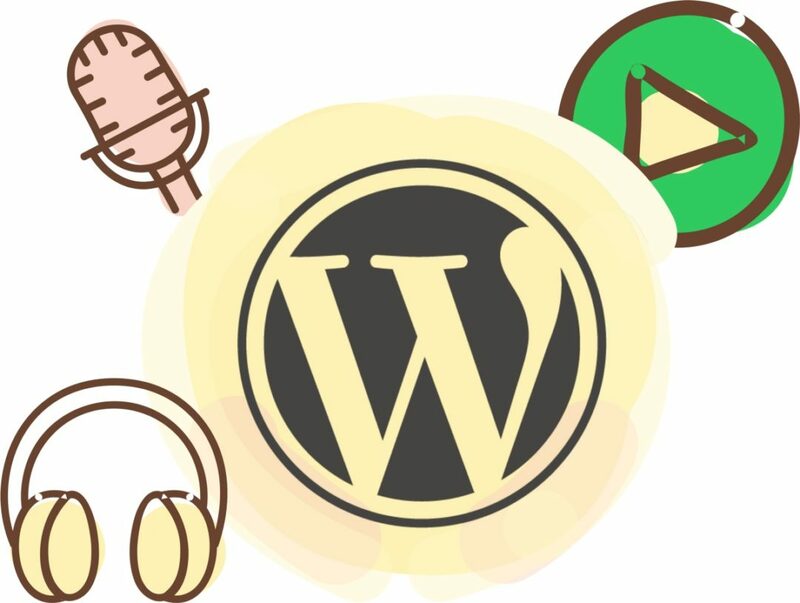 After you have activated the plugin, you need to Sign up to receive the free credits that you will use to convert articles to audio and try the product. 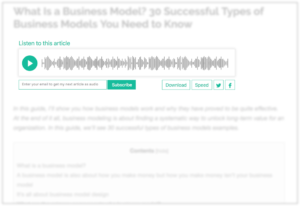 You will receive 3 free credits, and each credit allows you to convert one article to audio. 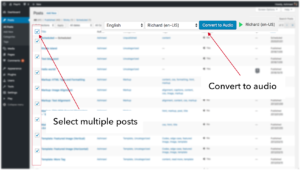 Now that you have signed and up received the free credits, it’s time to convert some of your articles to audio! Navigate to your All Posts section and you should now see Language and Voice drop downs at the top of the page. This is where you can select the language and voice for your audio. You can preview how the voice sounds like by clicking the green play button next to the voice. Play.ht supports over 18 languages with more than 150 voices! Once you have settled on a voice, select the post you want to add audio to and click the Convert to Audio button. You will see a popup with a progress bar. Converting an article to audio depends on the length of the article and usually takes around 5-10 mins. Once the article is converted, you will see a speaker icon next to the article in the posts page telling you that the article is now listenable. 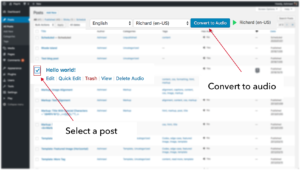 Of course, selecting posts one by one to add audio is a time-consuming process so we built a bulk ‘Add Audio’ feature where you can select ‘Multiple Posts at Once’, select the voice you want and click the ‘Convert to Audio’ button. The selected posts will be processed and converted to audio one by one saving you time. You don’t have to wait for them, you can close the admin if you want. 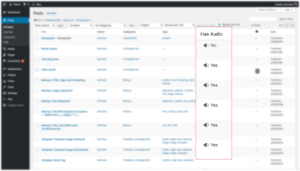 When the audio is ready, Play.ht will automatically add an audio player at the top of the post and make the audio available to users for listening. 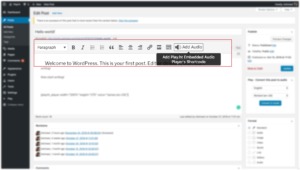 You can also add audio to a post from the Editor page from the Play.ht controls on the right side of the page. Play.ht supports over 18 languages and more than 150 voices! If you edit the text of a post that already has audio, then you can reflect those changes in audio by simply converting it to audio, again. 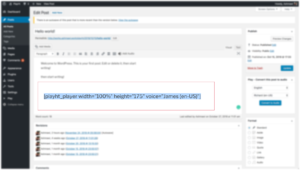 Since you are most likely to be in the editor page when you are making edits to the post, you can use the Play.ht controls from the right-hand side from this page to update the audio. Please note that updating an audio costs a credit. By default. Play.ht positions the Audio Player at the beginning of the article but you can place it wherever you like using the Audio Player’s Short Code. Go to the Editor page of the post. Look for the ‘Add Audio’ button in the Editor and click on it. Cut the generated Short Code and paste it wherever you like. There’s a lot of things you can customize in the audio player to change the look and feel of it and match it according to your theme’s design. And there are many things you can change to enable or disable certain functionality. 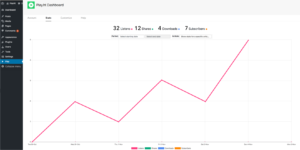 Play.ht provides you with a comprehensive report of how many users are listening to your articles. 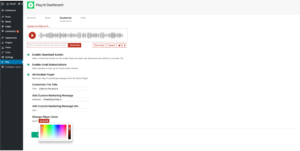 Listens – The number of people listening to your articles. You can also filter the data per article to see if some articles are being listened more than others. Downloads – The number of times your articles are being downloaded as audio files. Shares – The number of times your articles are shared on Facebook or Twitter as audio. We are always available for any help you need! Just send us a message on the chat from the Play.ht dashboard or email us at support@play.ht.